My plate came with a chicken-fried steak sandwich big enough to fill a grizzly, and enough curly-q fries to stuff a small pillow. I had to chip ice to open the beverage in my hand. Life was good at the aptly named Lakeview Café, looking out over a classic Ozark lake. 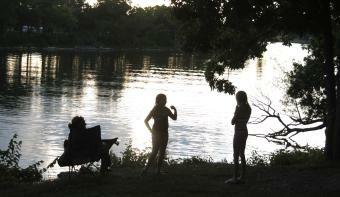 Others at southeast Kansas’ Crawford State Park seemed as happy. Across the way two children squealed as they caught bluegill and sunfish. Down the shore an elderly angler sat yards from a nice cabin as he waited for a catfish dinner to nibble on one of his lines. Near a dock, members of a family reunion bobbed in life jackets as they waited turns to be towed in a giant tube. At the back of a quiet cove two birders launched kayaks to float amid woodlands with pileated woodpeckers, warblers, red-shouldered hawks and more. Later whip-poor-wills and barred owls called as I slowly cruised the park near Fort Scott. Crawford State Park was the last of Kansas’ 28 parks for me to visit. It quickly proved the old adage about big things coming in small packages. The entire park is less than a square mile. Crawford State Lake is just 150 acres. But every square yard of land and water is “would you look at that” pretty. 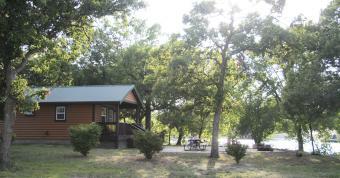 The park near the Missouri border is at the edge of the Ozarks and classic oak/hickory woodlands. Rocks seem more abundant than soil and make for a gorgeous shoreline. The lake’s water is so clear you can identify fish in three feet of water. Water is visible from all campsites. Many sites are just a few easy steps from shallows with a solid rock bottom. Park guests have access to 11 nice docks. Guests can swim, fish or kayak in relative peace and safety. Many areas at Crawford State Lake are classified as “no-wake” areas. In those places, which border most of the campsites, there are no surf-sized wakes from power boats or personal watercraft rocketing by. To me, it seemed most of Crawford State Park is in a “no-wake” state of mind. Things moved quietly and slowly. A smooth road encircles the lake, and others weave in and out of campgrounds. All are perfect for jogging, slow walks or peaceful bike rides for even those with training wheels. The Deer Run Nature Trail is an easy walk of less than a mile through gorgeous mature forest, and past stone ruins of a historic army camp. The park’s Dry Creek Mountain Bike Trail is seven miles and rugged enough to draw serious bikers and hikers from several states. 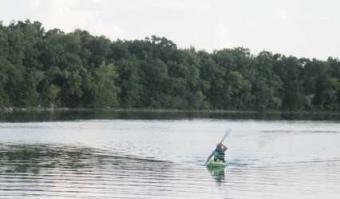 Next time to Crawford State Park I’d like to stay in a cabin with my wife and kayak over to the Lakeview Café. I’ll stick with the chicken-fried steak sandwich and mountain of curly-qs. I see no need to change a thing.